A group of press-ganged travellers seizes a ship and becomes embroiled in the troubles and machinations of the Shackles - a beautiful island chain dominated by pirate warlords. As the new freebooters make names for themselves, rival scalawags, enemy navies, legendary sea monsters and the infamous Hurrican King himself seek to see them walk the plank. Who will survive when there's glory and plunder at stake? 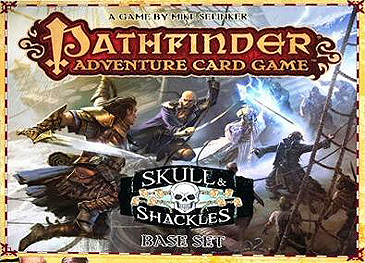 Embark on a campaign of pillaging, piracy and politics with the Pathfinder Adventure Card Game: Skulls & Shackles Base Set. This complete cooperative strategy game sets 1 to 4 heroes against the monsters, surprises, flamboyant privateers and treacherous terrain of the Pathfinder Roleplaying Game's most popular Skull & Shackles Adventure Path. Choose your character's class; build a deck of retainers, gear and magical marvels; and explore perilous locations as you play through multiple scenarios in an exhilarating nautical fantasy adventure. Characters grow more powerful after each game, adding new equipment and eldritch magic to their decks while learning expert skills, all of which will prepare them to surmount greater obstacles in a complete Pathfinder Adventure Card Game Adventure Path. More than 500 cards, featuring 7 character classes, a wide array of gear and magical accoutrements, and dozens of allies, monsters and villains from the Skull & Shackles Adventure Path. The Wormwood Mutiny Adventure Deck, the beginning of the Skull & Shackles Adventure Path. BONUS! A pack of 10 Deck Protector card sleeves from Ultra Pro!